The weather had been atrocious – gales and torrential rain had prevailed for well over a month all over the country and there had been ﬂash ﬂoods in the area of North London where I live. Indeed, a beekeeping friend had had his two hives washed away by a local brook which broke its banks on one of his out apiaries. I went with great trepidation to Foxes Retreat – my own apiary. The trees were standing in about a foot of water. The hives on their stands had water just nearby. The roofs were in place, all seemed satisfactory. 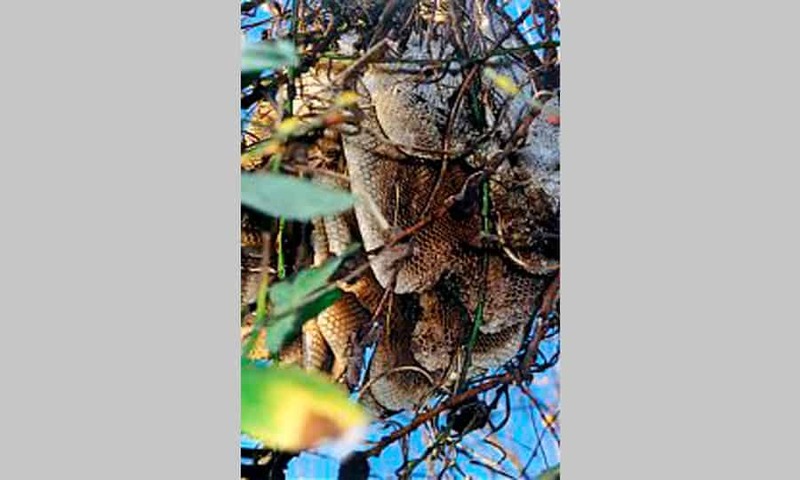 As I turned to leave I chanced to look up and in a tree branch, overhanging one of my hives, was a black plastic bag – well, I thought it was a black plastic bag –but on closer inspection discovered it was ‘Wild Comb’ with bees coming in and going out from the comb. I couldn’t believe it! This was the ﬁrst week in December for goodness sake! I thought it was a black plastic bag – but on closer inspection discovered it was ‘Wild Comb’ with bees coming and going. I dashed home to ﬁnd my camera, took a couple of photos (nobody would believe me if I didn’t) and went and phoned Peter. I told him that he’d need a big box – I told him that there were bees in it and I told him ‘to come quick’. Well, of course he didn’t believe me – he brought his nuc box – and of course he didn’t believe that there were any bees in it – he didn’t bring any protective clothing either. He did bring his secateurs though to trim branches if necessary. When he began to carefully trim one or two branches quite a number of them came out and told him to ‘shove off. The nuc box – wouldn’t go anywhere near accommodating them. Why don’t people listen to me? So, the next day, armed with ladders, a very large box, honey hunters and saws etc, we went over to the apiary. Peter went up the ladder with the saw and I stood underneath with the ‘very large box’. We lowered her gently into the box (note the change from ‘it’ to ‘her) and carefully wrapped her up. She went to Peter’s garden where he placed her in an empty WBC hive and fed them some warm syrup. They had shelter, they were fed, they were happy. Unfortunately, for the following feed no bees came up to be fed – alas, we had found them too late. I called them Saint Nicholas because I found them on his special day – all my hives have names which make them ‘special’ to me. We think the swarm must have gone there in June while I was on holiday. With leaves on the tree and being at that height they lived undetected while I worked merrily away underneath with ‘Danny’ and ‘Danny Boy’! I suppose this shows that Beekeeping is not a hobby that goes by the book. Bees have minds of their own and we try to understand them.